James McAvoy plays Simon, the unreliable superficially likeable hero of the heist - a gambling addict that does an inside job on his auction house, nicking a priceless painting but getting koshed on the head by his accomplice Franck (Vincent Cassel) in the process. Suffering from amnesia, the gang take him to a hypnotherapist - Rosario Dawson's Elizabeth - hoping to get him to remember what he did with the painting. In the process, we see Elizabeth emerge as a femme fatale, Franck reveal his vulnerable side, and Simon reveal his inner nastiness. It's all very slick, very twisty and, because all three characters look rather nasty for much of the runtime, rather alienating. The problem with the film is that by the time you realise that there are real emotional stakes, and that the people that you think are rock-hard and manipulative are actually acting out of hurt and self-preservation, you simply don't care. And just as you're not caring, you start to think back to all the little scenes of the film that make no sense. And that you want to go home and look up the IMDB message boards to figure it out. Good films aren't about solving the puzzle. The puzzle is just the MacGuffin upon which we hang the emotional drama. And if we're too busy working out which bits ape THE MATRIX, or INCEPTION or MEMENTO or ETERNAL SUNSHINE, and which bits just don't work at all, or whether they really got away with turning pubic styling into a major clue, then as a director, you've failed to grab my interest in a way that is meaningful. TRANCE is currently on release in the UK, Ireland, Australia, Chile, New Zealand, Russia, Brazil, the USA, the Netherlands and Canada. It opens on April 18th in Kuwait, Lebanon, Estonia and Lithuania; on April 25th in Portugal, Macedonia and Serbia; on May 1st in Taiwan, Hong Kong and Singapore; on May 3rd in Mexico; on May 9th in France, Argentina and Romania; on May 16th in Greece; on June 6th in Hungary, Poland and Sweden; on June 13th in Croatia, the Netherlands and Turkey; on August 8th in Germany; and on September 12th in Italy. 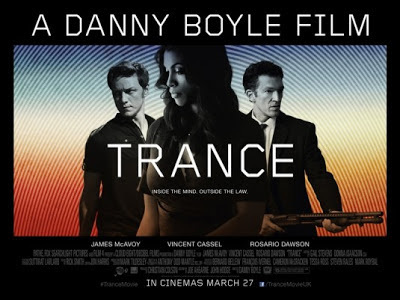 TRANCE is rated R in the USA and has a running time of 101 minutes.